Received my Google Wave preview account a few days ago. First reaction was to treat Google Wave like email. But that would be limiting its potential for use. I think of Google Wave as an online document (wiki/ email/ google docs) that allows conversations (add/ remove participants/ follow discussion threads). With Email, we tend to think of recipients primarily as readers. Google Wave recipients are more like potential participants and document collaborators/ contributors. They can edit directly onto your original document (i.e. email in that traditional sense) and/ or reply as sequential threads. I understand Google Wave to be mainly a communication tool, with features more inline with what the hyperlinked, collaboration (edit-anytime), social (join in anytime) conversational aspects of the Internet. A wave can get pretty very long. Akin to reading a discussion forum thread. This is where the Playback feature comes in really useful. You can replay, like a video, the thread of the document from start to current status, showing who added what and so on. You can also skip and forward. Nice. 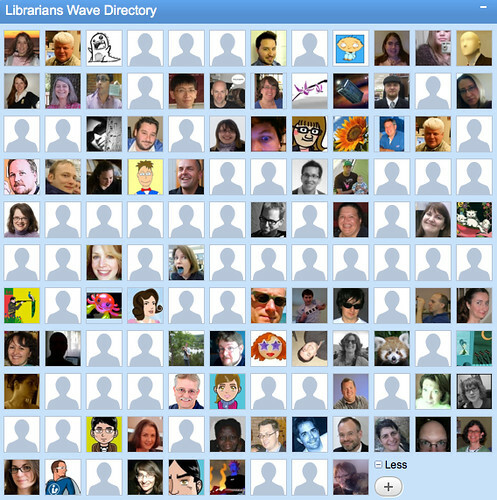 Interestingly, and gratifyingly, librarians have started something going on Google Wave. I was going to add an entry to that wave but couldn't make up my mind to try an alphabetical listing from the top or bottom. Along the way, some librarians forgot to adhere to the alphabetical listing request. I found that clicking the "117 more" link at the top was a nice way of seeing the directory in a graphical view. One enhancement that would be nice was if the mouse-overs had some consistent display, like name/ blog URL of the person. And would be nice to be able to embed an Excel spreadsheet in a wave. 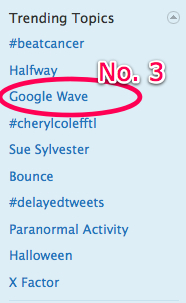 It didn't surprise me Google Wave just became a trending topic on Twitter (though about an hour later it seemed to have dropped off the chart). It also didn't surprise me to read some tweets that went along these lines: "Woohoo, I've got my Google Wave account! But I've got nobody to Google Wave with :(". Google Wave is a cool tool but ultimately you ought to have something to say or friends to connect. Right... and I wonder when I'll receive the first Google Wave spam. I am not on wave yet, but hope to be soon. It sounds interesting, but I wonder if I could get my colleagues and other people I collaborate with to use it right away, or if they will wait until it is an accepted medium. As you said, it isn't really worth it unless you have ppl to wave with. @DK - heh, if you have to ask, it's not spam. You're on Google Wave, aren't you? I'll wave you if there's something to talk about. I may Ping you just to try it out. @Srcsmgrl - your wave account would come with a few messages from Google Wave, on what you can use Google Wave for. So that might help. I suspect the speed of adoption depends on the imagination and creativity, and perhaps the urgency of need, among you and your colleagues. Once you get your account, feel free to Ping me. Hey Pheobe, I ran out of invites. But if you really want one, email me. I'll ask my friends if they can send you an invite.